Click here for 30 full quotes from Barack Obama in the book The Blueprint for Change. This campaign booklet is not actually a printed book, but a 64-page PDF that the Obama campaign would like voters to treat like a book. Since we here at OnTheIssues.org are happy to have candidates lay out their platforms in writing, we DO treat it like a book. It's available for download on Obama's campaign website. Each of a couple dozen issue topics has a speech excerpt summarizing Obama's stance on the issue; then an "At a Glance" bullet list; Obama's definition of "The Problem"; "Obama's Plan" for details on how he would address the problem; then finally "Obama's Record" for a list of his accomplishments on the issue. Obama has been accused of generalizations instead of policy. He could counter, "All the policy details are there in my 64-page booklet." But that would not sound like Obama. It WOULD sound like Al Gore, who said that so many times about his campaign booklet that the press took to calling it his191-page Economic Plan. 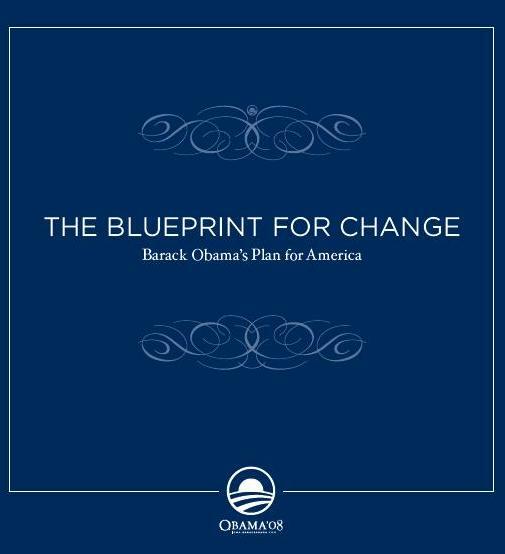 George Bush's considerably shorter campaign booklet,Blueprint for the Middle Class is, like Obama's booklet, full of bullet points and vision. It's clear from Obama's choice of the term "Blueprint" in his title which model he chooses to emulate. Unlike Gore's wonkish level of detail, Obama's booklet is indeed very long on rhetoric and short on policy. This booklet is DETAILED in the sense that Obama lays out his vision clearly and explicitly. How exactly that vision will get accomplished is not here. Perhaps Gore proved that being a policy wonk is not a good way to get elected, and that Bush's vision-without-details is. "Thank you for taking a look at this booklet. I believe it's critically important that those of us who want to lead this nation be open, candid, and clear with the American people about how we will move forward. So I hope this booklet gives you a good sense about where I stand on the fundamental issues facing our country. "But I also hope that this booklet sparks a dialogue and that after you've finished reading it, you get in touch with our campaign and give us your thoughts on the policies you find here. It's time to put government back in your hands, where it belongs. If we want to have policies that are good for the American people, then we need the American people to help shape those policies." Expand access to contraception; reduce unintended pregnancy. Protect consumers with Credit Card Bill of Rights. More accountability in subprime mortgages. Fight job discrimination to give women equal footing at jobs. Remove discriminatory barriers to the right to vote. Reduce recidivism by providing ex-offender supports. Ban racial profiling & eliminate disparities in sentencing. Fight to rid our communities of meth. Expand drug courts; help prisoners with substance abuse. Children�s First Agenda: zero to five early education. $4,000 college tuition for 100 hours� public service a year. Reduce carbon emissions by 80% by 2050. Passed tax credit for installing E85 ethanol at gas stations. Regulate animal feeding operations for pollution. Expand flex-work & Family and Medical Leave Act. More Transition Assistance for displaced workers. Shine light on federal contracts, earmarks, & proposed bills. Ended corporate jet travel subsidized by lobbyists. No one turned away due to illness or pre-existing condition. Buy private insurance via National Health Insurance Exchange. Expand Peace Corps and AmeriCorps to 266,000 slots. Pursue goal of a world without nuclear weapons. Improve veterans� mental health treatment & PTSD benefits. Fight attacks on workers� right to organize & strike. Focus farm programs on family farms, not giant corporations. Stop any efforts to privatize Social Security. Incentives for next-generation broadband in every community. Two-state solution: Israel & Palestine side-by-side in peace. Create 20 Promise Neighborhoods in high-poverty cities. Barack Obama's Plan for America.